My students absolutely loved this mini-lesson. This is what everything looked like, after I laminated it. 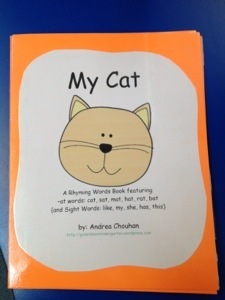 The orange “My Cat” book is an easy emergent reader book and is a printable black and white book. It is 8 pages total. This is the teacher copy and it is in color. I printed a black and white paper copy for each child and allowed them to color in the picture on each page. The featured sight words in this book are: LIKE, MY, HAS, SHE, THIS, IS. 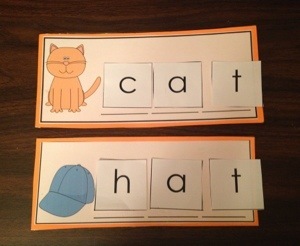 The featured RHYMING words in the “My Cat” book (as shown on the picture cards above) are: CAT, HAT, FAT, RAT, BAT. 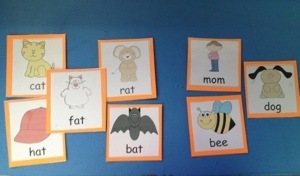 Vocabulary words shown are: MOM, DOG, BEE. 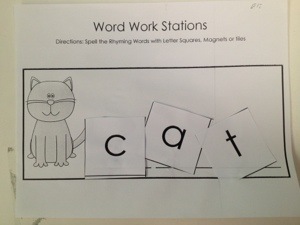 Word Work Station 1: Directions: Practice together in whole group using magnet or practice letters, or even letter card pages (m, a, t, f, b, c) to form the words: rat, cat, hat, bat. 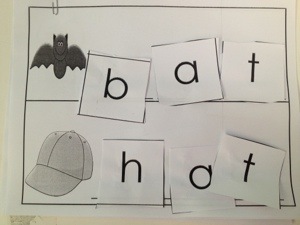 (Above) Word Work Station 2: Directions: Practice together in small group using letter card pages (m, a, t, f, b, c) to form the words: rat, cat, hat, bat. Use glue next. 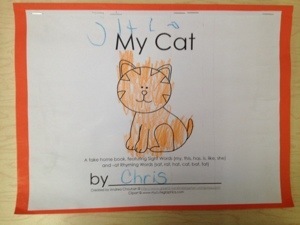 These are the pages that the child gets to take home or save in his/her portfolio! (Above) “Cut Apart Sentences” – Directions-As a whole group, read the story and then pass out the word cards one sentence at a time. 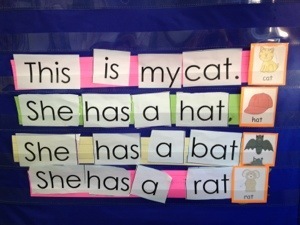 Decide the correct order of the sentence and then glue it to a sentence strip. Add the matching laminated picture.